Put the Poi in your hands and start swinging them in the direction shown. Take note that the palms of the hands are only facing down and forwards. 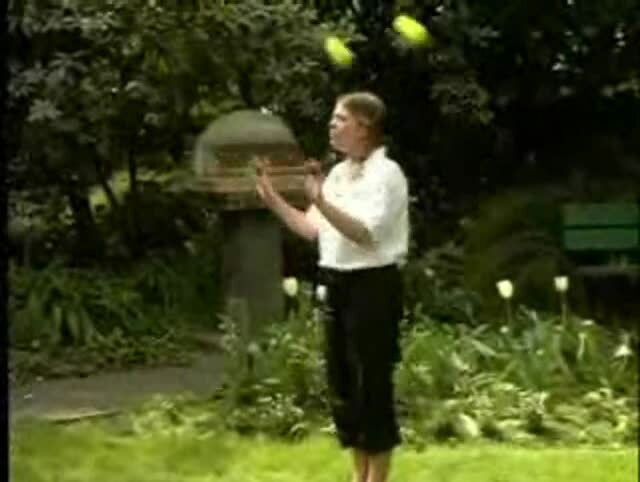 Tips/Hints: If you swing with your palms facing each other the Poi will come in together and cross or tangle. So always keep you palms facing down and forward. Pretend to push air away from you as the Poi pass over your head. how are the fingers positioned in the handles?? I have a double loop handle and i cant get comfortable and its hard to position so that my wrists are facing away from each other as shown and as a result my poy are on an angle when they swing.. arrggh what am i doing?? "when you have nothing left to burn you have to set yourself on fire"
dont know hat you're doing. i get it but i'm having a hard time with my Poi.. it's because i'm only using a Sock Poi,, cause i don't know where will i buy a real cone Poi (cause i'm a beginner) please respond,, and tell me where can i Buy Poi here in the philippines, (specifically here in pampanga) tnx. can i use rings for that?? because i don't have any available Poi with loops..
Pince the end of your Sock Poi with your thumb and fore finger. Once you find a comfortable fitting for your handles [there are MANY different ways to do so, just find one that fits you] go and find yourself a nice big wall...stand parallel to the wall and spin with your hand by your hip. both directions. allow your Poi to hit the wall, doing so will align then to a correct plane. once you get confident enough you should be almost flush against the wall...do this for some time with both hands, in both directions, facing the wall, away from the wall, in front of you, behind you, and all places you can think to place your arm when spinning. this will make you very comfortable with your Poi and you will later be able to spin with ease in places many find difficult. i have been spinning for some time now, and i've done this training exorcise recently, and it dramatically helped my spinning. A circle is a beautiful shape...I love being able to use this shape and recreate it in many forms through poi! I have what she is using I believe accept mine are clear for glow lights....anyway...how do you keep your Poi from strangling?? AND HITTING YOUR FACE??? Oh my god they hurt! fuzzy Poi. yes they can still hurt (depending on where your hit...) but they hurt ALOT less. Hello im also from the philippines. I started learning Poi just 2 years ago. I got my Poi from boracay ( Ribbon Poi and Fire Poi ) I think you can get those from places such that or better yet you can buy online. hope this is helpful. I can not d/l a vid with my connection and I'm not really getting a visual here, any pictures I can look at? Any tips for timing my swings my left hand keeps loseing rythrm. It can play with HTML5 or Flash, All Videos are MP4 (not FLV flash video). Maybe your phone cannot play mp4? the instruction says, Take note that the palms of the hands are only facing down and forwards but if you freeze frame/advance through the 8 second mark, you can clearly see that her palms are facing up at that point of rotation!!! Using the keywords [forward swing] we found the following similar topics.